Ayr United winning the Championship is a “once in a generation opportunity”, says chairman Lachlan Cameron. And Cameron says manager Ian McCall returning them to the top flight for the first time since 1977-78 would be “one of the most impressive feats” in Scottish football in recent history. Ayr lead the table by one point ahead of Ross County, who they host on Saturday. The Somerset Park side were only promoted from League One in the summer. Cameron says McCall has exceeded expectations this season. “It’s been a fantastic whirlwind,” he told BBC Scotland. “Since I’ve been there, we’ve been promoted four times and relegated three times – and every time it’s just been straight back down basically. “The idea this year was that we would basically consolidate, hold our position and build from there. But obviously we’ve started in fine fashion and the goals have changed from avoiding relegation, to a top-four finish, to promotion. 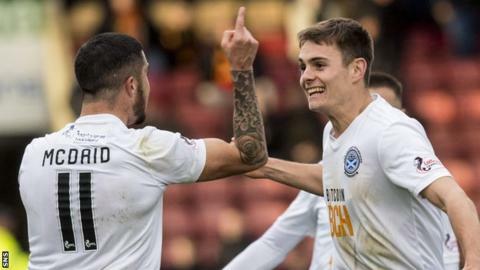 Much of Ayr’s promotion push rests on the form of Lawrence Shankland, who has scored 26 goals in 23 appearances in all competitions this season. And Cameron says they are not prepared to let the 23-year-old striker leave on the cheap. “There’s been rumours,” Cameron said. “The only thing I’ve heard is Swansea were potentially going to offer us £200,000 – and that’s it. And I haven’t spoken to Swansea direct. There’s been no contact from Swansea. “We’re in a very weird position in that he’s almost priceless because we have a once in a generation opportunity here to go for it. We’re in a good position. My understanding is our first XI is the best in the division. “I don’t know if I would be able to say I represent Ayr United to the best of my ability if I purely looked at it from a cash play. The long-term future of the club would be greatly enhanced with a promotion to the Premiership. “I’m not saying we’re going to do it, but I want to give us every opportunity to do that – £200,000 doesn’t really do anything for us.